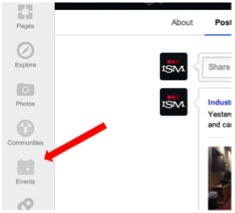 Use this walkthrough to plan and promote your event with Google+. No matter your stance on integrated digital marketing or the bottom-line impact of social media, it’s impossible to ignore the presence and growth of social media in the online space and the offline world. Names like Facebook, Twitter, and LinkedIn show up in everyday conversation and it has been reported that the average person checks their smartphone at least 34 times per day. Because so much time is spent using social media to be social, the point has been reached where companies cannot afford to ignore it. Social media is an accessible tool for engaging clients and prospects online, which will almost always cost less than the revenue the right digital marketing mix will generate. But online marketing does not exist in a silo. The true benefits of integrated marketing can be seen when offline events are successfully merged with, promoted through, and enhanced because of online efforts. That is what we will deal with in this post and we will focus on the one channel that has been synonymous with the online world since 1998, and which launched its own social network in 2011: Google. For example, say you have an event you’re putting on; Google+ can be particularly helpful in the promotion and documentation phases of your planning. Google has one of the largest connected networks on the planet, so promoting an event with a Google+ event listing will not only put you in front of millions of eyeballs, but will have the secondary benefit of helping your event rank well in search engines since Google+ is, after all, owned and promoted by Google. In summary, Google is one of the most powerful websites on the planet, has a proven track record of helping businesses, and is putting its weight behind Google+. So it behooves us to take notice. The first step in making use of Google+ to promote your event is getting your event listed and live on Google+, which you do through your business’s Google+ profile. If your business doesn’t yet have a Google+ account, you can register and start building your profile here. Once all the event details are in place, click “Invite” and choose which of your Circles to invite. By default, only those invited can see your event, although you can choose the “Public” and “Extended Circles” sharing options to get the most reach possible. Once everything is completed and your Google+ event page is live, you’re ready to integrate it into your other event marketing efforts and promote it like crazy. Now that you’ve created your event, it’s time for the fun to start. The first step is to insert the event page URL and a call to action (CTA) into all the promotional efforts you’re already doing for your event. This is the low-hanging fruit. Do you have flyers or posters? Update the graphic to include a shortened URL (preferably a Bit.ly, so traffic can be easily tracked) for your Google+ event and a CTA prompting people to visit the RSVP. Do you send emails to your clients? 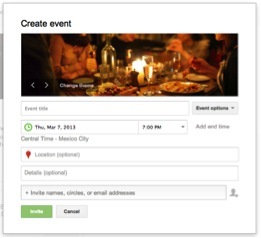 Create one highlighting your Google+ event page and ask recipients for RSVPs, pictures, and shares. Are you posting to Facebook, Twitter, and LinkedIn? Be sure to post the link to your Google+ event and gain traffic from the other social networks. Go into your Google+ event page and upload any promotional imagery you have prepared or any images from previous events (if your current event is part of a recurring series). Aside from the low-hanging fruit, there are a few other nifty features that Google+ makes available for event promotion. Google+ Events fully integrates with your Google Calendar, so not only can you have an automatic reminder on your company calendar, but anyone who RSVPs through their Google account can view and respond to your event via their calendar and will receive automatic reminder emails. Since all event attendees contribute to a public photo gallery for the event, be sure to encourage photo and video sharing. This not only gives a bit of clout to your event, but also makes it more likely that it will show up in search engine and image search results. It also further connects your clients and prospects with your Google+ profile so your future events and postings will have a higher likelihood of being seen. Finally, since Google+ is a Google property, it fully integrates with Google Analytics. If you are using Google Analytics, you can drill down through your social analytics and find out exactly how much website traffic you received from your Google+ event page, how many times your posts were shared, and how many +1s you got on your event posts. (If you’re not using Google Analytics, you totally should be, because it’s amazing and free. There’s a lot that goes into marketing effectively through social media. To succeed, you should focus on one thing at a time until you are comfortable with each of the platforms and your presence on them. If you have an event coming up or are in the initial planning stages for one, it’s the perfect time to jump in and master Google+ for events, adding an online dimension to your offline event. Integrated marketing takes time, but following the correct steps and fine-tuning along the way will lead to fully integrated event promotion that performs down to the numbers. If you have any questions or are looking for help promoting an upcoming event through online channels, please contact me at joey[at]marketstrong[dot]com. Have you used Google+ Events yet? What sort of responses did you see? Let us know in the comments below! Joey Strawn is Integrated Marketing Director at INDUSTRIAL and a forward-thinking social media and game strategist who loves helping companies explore and understand social media, digital marketing, gamification, and enterprise social media. He loves talking about social media and is always up for a good debate.